I love the snow. I wish it snowed more here. I live in a place that should get more snow than we’ve seen the past two years, but alas – not so much. That said, we had some beautiful snow today. 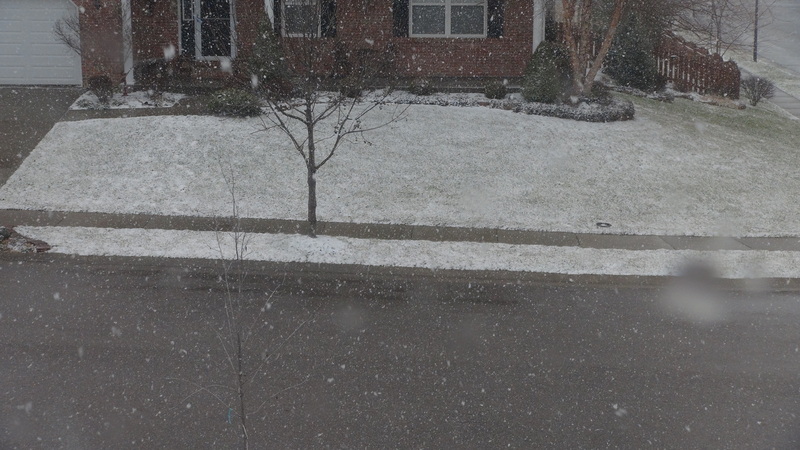 It was short lived, and no real accumulations – but beautiful nonetheless. Thank you, God, for the snow – can we have more? As I sit here, tears flood my eyes. Again. My heart breaks. Again. If I could send a message to Newtown, CT – it would be this: You are not forgotten! You are loved. Thoughts and prayers are still going out on your behalf. It’s interesting. The saying is true. Time doesn’t erase horrible things that have happened, but it does make them easier to deal with. That’s true. However, and I wasn’t even there that day, the emotions are still very real. My heart breaks, and my tears still fall. As I read accounts of those who followed that call of duty – to what has undoubtedly become one of the most horrible days of their lives, I still cannot imagine. I read a really great article last night. It was so real. So down to earth. It was that day, all summed up. There was a massive amount of information (I’m sure) not put out there, mostly out of respect for the families, as well as to protect the integrity of the ongoing investigation. However, I am grateful to have read it. Not because I like to cry, but instead because I like to pray. This article is a recipe for how to pray. If you ever aren’t sure how to pray, read it. It’ll break your heart, but it will help you pinpoint your prayers. Newtown, CT – you are not forgotten!! I don’t normally post stories like this, especially ones that have me in tears over and over again. However, God’s got Newtown, CT on my heart – and this article explains a little bit of why. As I sit in tears reading this, my heart continues to break with all those who lost someone that day, as well as with all the first responders still healing as well. Please take a moment to pray for those involved. They still need it. This article is heartbreaking, but it is a recipe of how to pray. SWAT – The Shoes Of Peace. This is the title of the message from the current series – and yes, I am thankful for it. The truths found and shared in this message speak for themselves. I am so grateful for a pastor and a church who seek the face of God, and share Him with our community and beyond. The words spoken – in this case about the shoes of peace – are powerful. We have discussed the armor and weapons necessary to keep you safe during times of battle. This is the video from this past Sunday’s service. I am honored to walk through life with friends. What I really like is when God opens up doors, and allows for new friendships to emerge. Something amazing happens when people open up and share – strengths and vulnerabilities. Opening up, and allowing friendship to happen – priceless. You may be like I am – or at least WAS – and think you are okay walking through life alone, or with very few people by your side. And, while that may work for a season, it will not ever work long term. As I have mentioned time and time again, we were created as community people – to do life together. We weren’t meant to walk through life alone. I am grateful for friendship – that beautiful relationship that grows and turns a friend into family. I am grateful to God every single day for my family – those especially that I am connected to by blood, but on a different level, those family connected through friendship and the body of Christ. It is nothing short of amazing to see how God can connect people and provide grace, love, hope, support, encouragement, and so many other things as people link arms and do life together.